The black CPNTA2HDMI Component to HDMI Video Converter with Audio from Startech lets you convert and combine analog component video (YPbPr and YCbCr) with corresponding audio (digital or analog) into a single HDMI output. The component to HDMI converter supports high-definition video resolutions of up to 1080p and 5.1-channel audio, providing the quality and convenience of HDMI without the expense of having to upgrade output devices for HDMI compatibility. 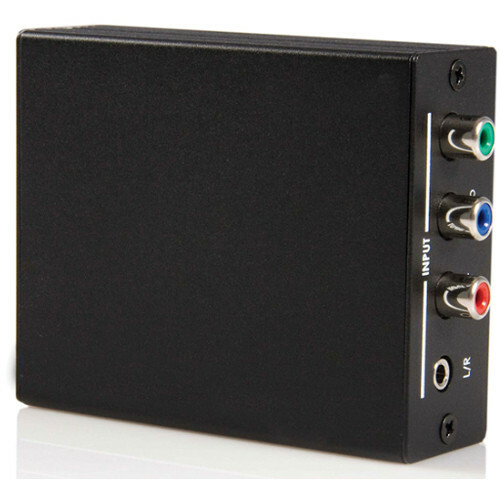 This unit is suitable for use with HDTVs (LCD / PLASMA / DLP) by connecting standard and high-definition devices to an HDTV through an HDMI port. Box Dimensions (LxWxH) 8.268 x 4.8 x 2.441"
CPNTA2HDMI Component to HDMI Video Converter with Audio (Black) is rated 4.5 out of 5 by 2. Rated 4 out of 5 by NOVA Digital Films from Works with Atomos recorders Anyone trying to figure out how to record to an Atomos from a camera that only has component output probably has gone through three or four converters trying to find something that accurately conforms to HDMI standards and can be captured by a Blade/Ninja/Samurai and ended up terribly frustrated. Get this device and stop worrying. Takes 23.976p and 59.94i out of cameras like a Canon XH-A1 reliably and without hiccups, making it about the only way to leverage legacy HD cameras alongside SDI and HDMI systems, which is a fairly common issue in worship systems and low-budget studios. Rated 5 out of 5 by Larry from Canon XH-A1 to Ninja Blade I purchased this product to convert component video from an older Canon XH-A1 video camera to HDMI and record it using the Ninja Blade. It works well for this purpose. Can also sync the video directly using this converter; or feed the video from the camera separately into the Ninja Blade, which will sync it as well. Allows me to get some additional life out of a good camera. I had tried another converter from KanexPro, but that one did not work for me. Can this go mobile with external power? Is this Startech converter compatible with a Canon XH-A1 component out cable to an HDMI Atamos Ninja Inferno? If not, what are some cost effective alternatives? Yes it is - I have used it successfully with component out from an XHA1 and an inferno. Not certain if audio sync is lost, though. I used it some time ago with a ninja 2 and there was a slight sync problem. Havent tested with this unit yet. Does the converter require an HDCP compliant device to connect to? I would like to use the HDMI output of the converter and connect to the HDMI input of a video capture card in a PC. The device will not remove the HDCP encryption from your TV for example when connected to another capture device. it will only work to convert HDMI to component and will not remove the HDCP encryption.